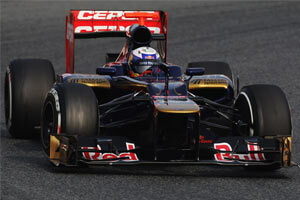 The STR7 was revealed on 6 February at Jerez, a day before the start of winter testing at the same circuit. The car was presented by the team's new drivers, Daniel Ricciardo and Jean-Eric Vergne, while at the same time a new sponsorship deal was announced with Nova chemicals, along with an extension of their existing CEPSA deal. Technically, the car follows a similar design strategy as its predecessor, with long sidepods with a large undercut. Technical director Giorgio Ascanelli explained: "The third point relates to the exhausts as the rules now demand we relocate the exhaust exit to a more benign position, which effectively means no low exhaust blowing under the diffuser just ahead of the rear wheel. This has involved moving the exhausts higher, to where they were in 2009, before the new rules regarding bodywork had come out. This rule change has therefore led to the loss of a very high energy stream that will slow the cars down considerably, unless of course someone has come up with something particularly interesting! The exhaust blowing restrictions will effectively reduce the effect by a massive amount, down to about 10% of what it was last year." All in all, the car failed to live up the team's expectations, and it was later confirmed by the team that there was not enough room to alter the weight distribution in order to make the car work properly at every venue. It was also admitted that the suspension layout did not allow for enough different set-up possibilities and that the high sidepod layout was increasingly difficult to develop.